Four Good Samaritan commercial fishing vessels responded to provide aid, including the Sea Dawn, Northern Jaeger, Excellence and Golden Alaska. Seventy eight of the 120 crewmembers were evacuated onto the smaller Good Samaritan vessels and transported to Westport, Washington. Forty two crewmembers remained aboard the ARCTIC STORM to man the vessel. As of late yesterday evening, a tug was on its way to transport the ARCTIC STORM to Aberdeen, Washington. The vessel is expected to arrive in Aberdeen sometime today. 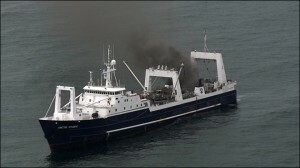 The ARCTIC STORM is run by Arctic Storm Management Group of Seattle and fishes for Pacific Whiting from May through June off the coast of Washington and Oregon. There have not been any injuries reported yet in relation to this incident. However, large scale shipboard disasters like this often lead to crewmember injuries. For example, crewmembers are at risk of injury while participating in firefighting activities and throughout the hectic rescue process. Any crewmembers injured as part of these activities are entitled to maintenance and cure and possible compensation under the Jones Act and general maritime law. Situations like this that involve assistance from Good Samaritan vessels like those that came to assist the ARCTIC STAR, may also raise issues of the maritime law of salvage. In some cases, where a Good Samaritan vessel responds to provide aid to another vessel in distress, the Good Samaritan vessel is entitled to some level of compensation from the owner of the vessel it assisted. This rule has developed in maritime law to create incentive for vessels to help others out when there are emergencies at sea.